Why is Red Hen selling fertilizer? The big mass merchandisers have diluted their products so much they no longer deliver the essential nutrients grass plants in the Michiana area need. Because of these watered down programs, we are getting more problem lawn calls that can be traced back to these insufficient programs. The most responsible fertilizer program starts with taking an inexpensive soil test and then tailoring a fertilizer program to correct soil nutrient deficiencies. We don’t know of anyone else doing this and we want to offer consumers this option and assistance. Instead of consumers reading small print on aisles and aisles of bags, trying to figure out what is best for their lawn, we believe in helping people choose the right fertilizer program for their lawn. Since lawns are not standard 5,000, 10,000 or 15,000 sq. foot sizes, we don’t think consumers should have to buy fertilizers that way. 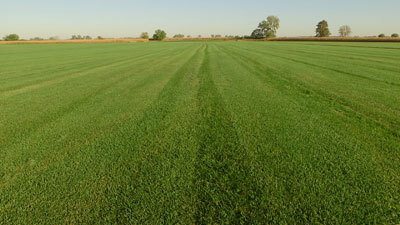 You tell us the square feet of your lawn, and we will tell you how much fertilizer to apply. 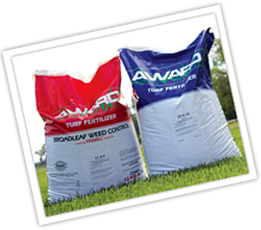 We think we can offer customers better fertilizing programs at prices less than they are paying at big box stores. Always read and follow the instruction label on pesticides. Pay close attention to personal safety precautions. Avoid over spreading of fertilizer and pesticides on sidewalks and streets as they can become a pollutant in retention ponds and streams. The first line of defense against weeds is to have thick grass and mow at minimum of 2.5 inches high as measured in the turf. Proper fertilization is essential for thick turf. Mass merchandisers of fertilizer in the past years have decreased the amount of potassium contained in their products, which decreases plant health and leads to turf thinning. All turfs have grubs, but they don’t cause a problem until there are more than 7 of them per square foot at the base of the grass plants. We believe that advertising has caused many people to treat lawns for crabgrass and grubs when the risk of problems is low. 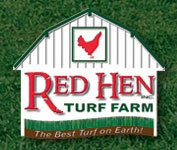 We will sell programs that treat for crabgrass. Once people thicken their turf with proper fertilization, the need for crabgrass prevention often disappears.